In this journey of reclaiming our soul voice, it’s not about simply learning to be loud or learning to be confrontational or direct. And we don’t want to mistake finding our voice for an excuse to become overly focused on ourselves. Being on this journey, holds far deeper meaning. It’s about healing the broken parts inside of us so our soul voice can be brave, strong and free. It’s about learning to be in touch with who God made us to be and then living from the fullness of that beauty. It’s about silencing the lies we’ve believed and, instead, allowing His truth to rejuvenate us at our core. It’s about trusting God to love us and use us exactly how He’s made us. It’s about perfect love casting out fear. But how do we do all of this? I’ve learned this can only happen through our own personal encounters with the Holy Spirit. The small, still voice had interrupted me before. I had heard it whisper to write my story at a time when I was wondering what my purpose was. I had heard it whisper to hold on, you’re not alone at a time when I was disrupted by suicidal thoughts. I had heard it whisper to go on a radical journey of self-love at a time when I could not love myself. Amidst all the cacophony of noise in my soul I knew, beyond doubt, that this voice was true. This voice was leading me towards wholeness and peace. This voice was saving me. So when our church challenged us to be still and pray fifteen minutes a day, I was IN. Each morning, I set my alarm early – really early – to ensure some quiet before my kids woke up. I’d pour a piping hot cup of coffee, tip toe over to my favorite chair, wrap up in my faux fur blanket and I’d sit. Coffee in one hand, iPhone (opened to Notes) in the other. And I’d wait. I waited until I heard that still, small voice begin to speak to me. Some days I’d have to wait longer than others, depending on the noise in my head. But eventually, I’d hear. Because self-doubt is second nature to me, every once in a while, I’d wonder if what I was hearing was actually God. But then I’d remember a simple explanation I had learned: the Holy Spirit sounds like our stream of consciousness in our head, but it speaks only what is good, lovely, encouraging, convicting and true. In essence, this voice produces what is known as “the fruit of the Spirit” – love, joy, peace, forbearance, kindness, goodness, faithfulness, gentleness and self-control (Gal. 5:22-23). Bit by bit, morning by morning – coffee in one hand, phone in the other – I’d hear truth. Truth about who I was and who I was not. Truth about where I had been and where I was going. Truth about my pain and how I was healing. I’d imagine Jesus sitting in the chair next to me, I’d imagine him looking at me and it always came back to those eyes. Those eyes that loved me tenderly, deeply – ever FOR me. I’d type down what I’d heard and let it sink into my soul. If something was weighing on me that day, I’d ask what he thought about it. 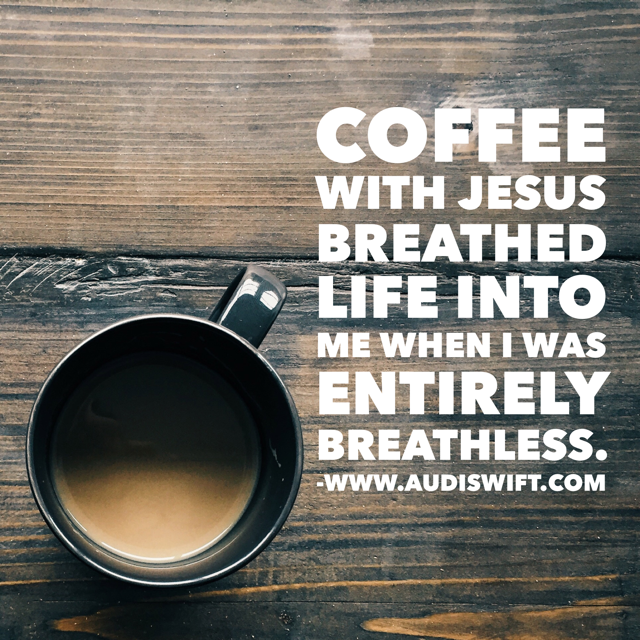 Drip by drip, my “coffee with Jesus” moments breathed life into me when I was in a season of feeling entirely breathless. Have you ever stopped to be still and just listen?